Castledermot Local History Society has been around since 2010 and since then has been encouraging research into and promotion of the town’s long and fascinating past. This year the focus was on hidden or lesser known aspects of the local heritage. Thanks to a Kildare County Council Community Heritage Grant, digital heritage specialists Gary Dempsey and Orla Power were engaged to create 3D digital models of a selection of the lesser known stone monuments in St James’ Graveyard and Church. Gary Dempsey specialises in photogrammetry – a technique where numerous photographs, taken from various angles, are put through a special computer programme to create the 3D image. This technique can sometimes show up finer details that are difficult to see with the naked eye. Orla Power uses a high-tech 3D scanner that uses laser technology to take thousands of measurements. Her focus was the cadaver effigy that lies in the Franciscan Friary and dates to the early 16th century. This is the only monument of this type in County Kildare. 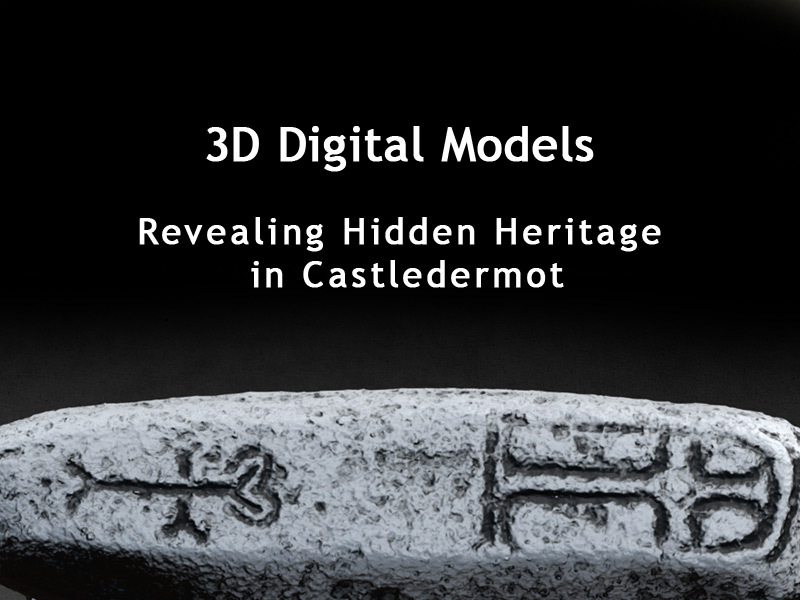 The results of both techniques are now available to view online at www.sketchfab.com/CastledermotHistory. This website allows the information to be stored and also allows the viewer to interact with the images by turning them to look at them from new angles. A grant from the Irish Walled Town Network means that there is a geophysical survey taking place in the garden at the back of Castledermot Library during the week before Heritage Week. The origins of this garden could be as early as the late 12th century, when the medieval manor of Tristledermot was founded. Early maps of the town suggest that the wall at the end of the garden is on the line of the medieval town wall (built between 1295 and 1302) – but the wall juts out here which has lead to speculation about whether the line on the map is correct or even that this may have been the location of the missing castle of Castledermot. The geophysical survey, to be carried out by Earthsound, Ireland’s largest archaeological geophysical consultancy (www.earthsound.ie), will hopefully answer some of these questions. A small paddock across Church Lane from St James’ Church will also be surveyed to confirm the line of the town wall in this area of the town. For updates of both projects, the public is encouraged to follow ‘Castledermot History’ on Facebook and @Tristledermot on Twitter. The committee of Castledermot Local History Group are very grateful to the landowners for permission to carry out these projects: Marian Higgins of Kildare Library Services, Mr Patrick Doyle and the Select Vestry of St James’ Church, Castledermot and to Kildare Heritage Officer, Bridget Loughlin and the Irish Walled Towns Network for their support.